On Thursday at the second long-distance qualification the competitors for the title “World Champion” have been identified. 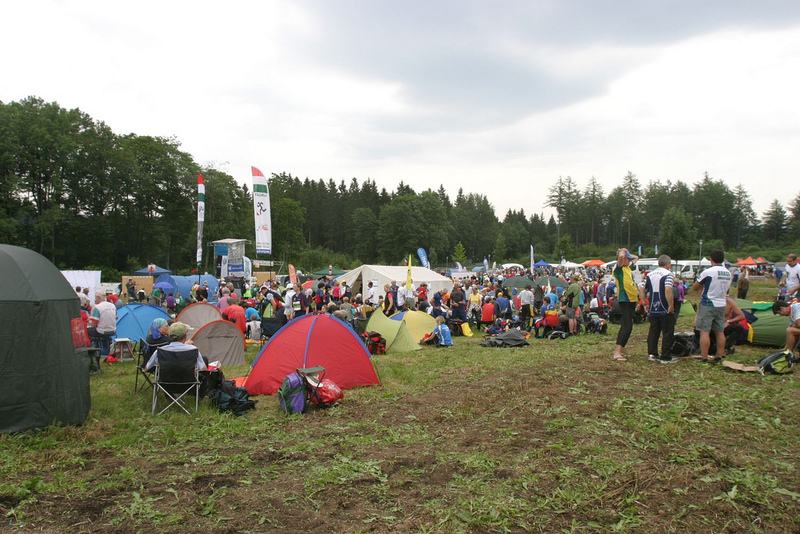 From 11 o’clock the ambitious orienteers were sent on track in woodland near Clausthal-Zellerfeld (and near also to the accommodation where most of the countless volunteers reside). The weather kept up – and the finish area transformed, thanks to some attractions and several shops, into an event centre once more. With two first placements each, the German high-calibre athletes Helmut Conrad (M70, USV TU Dresden), Michael Finkenstädt (M45) and Heidrun Finke (W55, both OLV Uslar) entered the final extremely sovereign. Angelika Kuleva (also W55, SSV Planeta Radebeul) reached the first place in her second race. But other Germans showed great form in the final qualification as well: Nils Schmideberg (SV Turbine Neubrandenburg) and Raik Zschäckel (IHW Alex Berlin) celebrated a double victory in the category M45. Second placements were gained by Anke Von Gaza (OLV Uslar) and Monika Depta (OLG Siegerland) in W40, Erika Lemnitzer (W70, Kaulsdorfer OLV), Manfred Hickethier (M60, SS Planeta Radebeul) and Michael Thierolf (M50, TV 1898 Alsbach). A crystal clear quintuple triumph was won by the Swedes in class W80. But also from Finland there were spectacular results: Pekka Kanste, Risto Orpana and Raimo Karvonen claimed places one till three in M65, in category M80 even the first four placements went to Finland. Meanwhile the Czech Republic succeeded in gaining five of six upper placements in one qualification race – in-between the German Ingo Horst (TV 1898 Alsbach) romps about. Finally a curious incident in W55 shall be mentioned: the first five placements were all gained by women born in 1957. The optimal tactic for both qualifications was chosen by Frenchman Philippe Page: in the first forerun the M45 runner was ninth. “I wanted to get used to map and terrain” he betrayed. He did well – and was rewarded with place four in the second race. An honourable approach as qualifications are tricky: it is impossible to win irrevocably in the first race – independent of the best time. But taking too high a risk, one can lose everything at every point.